Aloha Friday: Help! We’ve Forgotten How To Date! On Saturday night, after our first pumpkin carving, we left the kids with B’s parents and had one of those rare, wonderful moments called Date Night. Somehow, despite repeatedly saying how we should do this more often, we never get around to it. Illnesses, scheduling conflicts and life in general seem to conspire to limit our date night to a handful of times. When the prospect of date night is mentioned, I envision going out for a night on the town. Dinner, maybe dancing. Definitely someplace elegant that has as small a kids’ menu as possible. Worries (money, kids, etc) would be tossed out the window for the evening and we would just enjoy each other’s company. Afterwards, we decided to shop at a local Hallmark store. On the way there, we remarked about how some kids looked like they were up to no good. (Again, “kids these days” reference… I feel OLD!) The Hallmark store was closed so we went to a local grocery store and stocked up on food essentials. Wait. The grocery store? Our big date night out and the best we could do was dinner and shopping for food? Where’s the dancing? Where’s the movie? Where’s doing something fun together that doesn’t involve a shopping cart and a produce aisle? During our date supermarket run, I joked that we had forgotten how to date. We’ve been parents for so long and so focused on running the household smoothly, that I fear we’ve forgotten how to put the “parent” portion of our lives on hold and just be “two adults who are in love with each other” for a few hours. Our dating life seems in some need of some help. 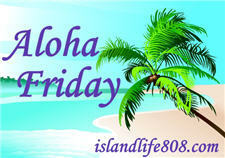 My Aloha Friday question for today is: Do you go on date nights regularly? If so, where do you go and what do you do? We go out to movies or two eat breakfast together. Sometimes we go just to a Home improvement center or and home show. whatever we do it’s a date. Charlotte | Life's a Charm! hubby and I go on date nights whenever we have the in-laws to babysit our kids. usually we go to watch a movie or eat somewhere nice. and if we are in a mall, whether we are shopping for food or for the kids, i make sure we drop by a photo booth and take some silly snap shots! this always works fine for both of us. good luck on your next date. I hope it’s everything you have envisioned! and most importantly, you both are having fun. Simply Cathi recently posted..Pink Saturday…Is Red!